Whew. I didn't realize that it had been so long since I have posted, almost 2 weeks. I just noticed today, that it has been 5 days since I posted on Facebook, too. Where has my time gone? Let me know, if you find it. Well, I have been busy working on another published tutorial. Altering a shiny metal empty alarm clock. And, well, its been a little bumpy. I did a fabulous job altering it, making it all grunge-y. But, that really isn't my style, or the look I wanted to put together. The altering process kinda went on it's own. Anyways, I removed some of the distressing, sand off the paint and gesso, and basically start all over. I am hoping to have it finished this weekend. But, we'll see. I'm keeping my fingers crossed. Anyways, I wanted to share an event I will be at next month. 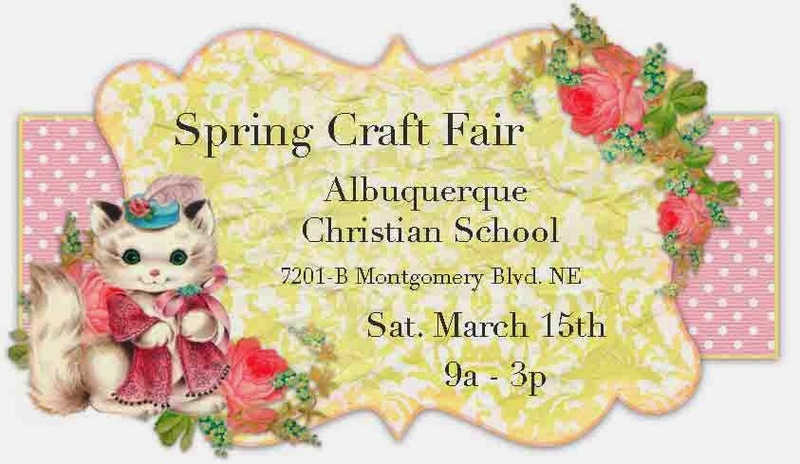 I am trying my hand at Arts and Craft Fairs that aren't during Christmas. I'd like to create and sell some non-holiday themed items. Spread my wings, so to speak. So, here is a little 'banner' I made, to promote it. Since my style is kinda vintage-y and a bit shabby, I went with this cute look. Love polka dots, and the fact that they are on pink ribbon, just makes it all the better. Love the bright yellow 'label' piece. And the floral pieces add a bit of elegance. I don't know if I'm totally happy with it. But, here it is. At this moment in time, I am working on making several card-gift combos to sell. Some altered mini notebooks that fit perfectly in a handbag/tote. I'm trying to finish a few altered clocks, boxes, and hopefully get a few houses done with a spring theme. But, we'll see. I'd also like to get some altered cloches made. (I made a few Christmas ornaments out of 'ball' cloches.) I'll keep you posted, and take some photos. I have started an InstaGram account. I put a 'button' with a hyperlink embedded in it, on my sidebar so you can find me, and opt to follow. I have a tendency to add more photos there. But, they aren't all crafting pics. There is a variety of different subjects. I'll post some crafts soon! Hopefully tomorrow!